The purpose of this study was to evaluate the relationship between night work and elevation of inflammatory markers. Regards to the side effects of shift work and circadian rhythms and sleep disturbance as one of the important cause of these side effects and on the other hand the elevation of inflammatory markers after sleep deprivation, the purpose of this study was to evaluate the relationship between night work shifts and elevation of inflammatory markers. The relationship between increased inflammatory markers and medical conditions, which is the same as side effects of shift work, has been observed in some studies. If further studies support the results of this study, we can use inflammatory markers for early detection of long-term health side effects of shift work in future for prevention of them. The subjects included 50 healthy workers who gave consent and were paid for participation in this study. Inclusion criteria required the healthy workers. Workers were excluded from the study if they had any history of inflammatory disease, cancer, chronic disease, psychotic disorder, drug or alcohol abuse, body mass index (BMI) >30, or smoking history (as determined by review of pre-employment and annual employment medical records). Workers who were determined to have sleep disorders according to their score on the Epworth sleepiness scale (ESS) and insomnia questionnaires were also excluded. Cutoff point for ESS questionnaire was 13 and for insomnia questionnaire was 8. They were also excluded if they developed any acute disease or reported poor sleep during the study period. We designed a randomized clinical cross over trial study with a specific shift work schedule. Group 1 (25 workers): they were scheduled on three days of day shift work, followed by one day off (wash out period), and then three nights of night shift work. Group 2 (25 workers): they were scheduled on three days of night shift work, followed by one day off (wash out period), and then three days of day shift work. Blood samples were obtained via indwelling catheter between 7:A.M. and 8:A.M. after the periods of day work and night work in both groups. Blood samples were divided into two parts; one part was transferred to a clot tube and centrifuged as soon as possible. The serum was frozen at −25°C until the enzyme-linked immunosorbent assay was performed. IL-6 and TNF-α were measured by ELISA (R&D Systems, Minneapolis, MN). The lower detection limit was 0.09 pg/mL. High-sensitive CRP was also measured by ELISA (IBL-International, Hamburg, Germany). The lower detection limit was 0.01 mg/mL. The second part of the sample was mixed with EDTA (anti-coagulant) for complete blood count and differential and analysis by a cell counter H1 device. SPSS 11.5 and S-data were used to analyze data using the Student's t-test and paired t-test. Descriptions of age, weight, height, BMI, ESS, and Insomnia questionnaires scores of workers are shown in [Table 1]. Despite random allocation of workers between the two groups, there were significant differences in age and ESS between the two groups. For omission of confounder effects of these variables, we used multivariant regression. There were no carry over effects in the two periods of study on outcomes except IL-6. So we just used data of period 1 for IL-6. 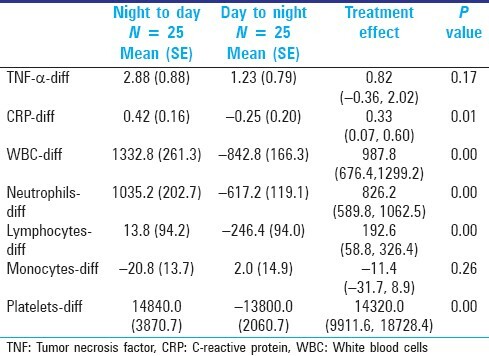 Compared with day work shifts, night work shifts were associated with increased levels of IL-6, TNF-α, CRP, WBC, neutrophils, lymphocytes, and platelets, but for TNF-α was not statistically significant. There was no significant change in monocytes [Table 2] and [Table 3]. Multivariant regression analysis was done for omitting the confounder effects of age and ESS between two groups [Table 4]. To determine the best model for eliminating the confounder effects of age BMI, ESS, and insomnia questionnaire score, Lr-test was done and none of these variables had significant effect. Association of elevation of inflammatory factors and sleep deprivation has been demonstrated in some studies, and we have demonstrated this association with night work shifts. 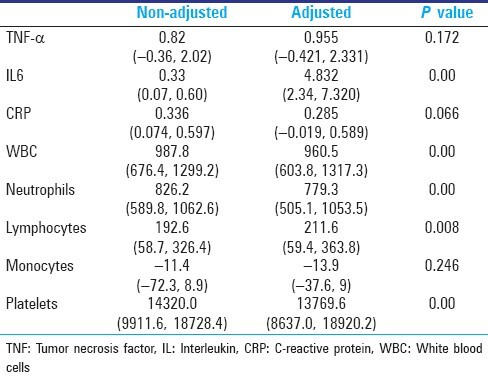 In this study, statistically significant increased levels of IL-6, CRP, WBC, neutrophils, lymphocytes, and platelets were shown. The change in TNF-α was not statistically significant. There was no significant change in monocytes. Cytokines are secreted in a biphasic circadian pattern. , Hence, to limit the diurnal variation of secretion of cytokines, we measured the outcomes between 7:A.M. and 8:A.M. The half-life of cytokines has been suggested to be about 60 min. So a one day wash out period was considered to be sufficient. However, in our study a carry over effect for IL-6 was observed with no precise description, so it may be prudent to further investigate the relationship between night shift work and IL-6. The study by Irwin et al. suggested that elevation of IL-6 and TNF-α is due to gene expression of inflammatory markers in each monocyte rather than overall increase in monocyte counts. There were no significant changes in monocyte levels in this study. This study showed an increase in inflammatory markers after night shift work. Mounting evidence has demonstrated an association between elevation of inflammatory markers and the risk of medical conditions, including cardiovascular disease, arthritis, diabetes mellitus, and certain cancers, which are reported in shift workers too. Thereby these results favor the hypothesis that the side effects of shift work may be related to elevation of inflammatory markers. Further studies are necessary to support our findings and if so, inflammatory markers can be used for early detection of health effects of shift work. If this hypothesis is proven, new studies need to be done to evaluate the effects of work place interventions such as bright light or rest breaks on inflammatory markers. If these markers decrease after these interventions, side effects of shift work may be preventable. If further studies support the results of this study, we can use inflammatory markers for early detection of long-term health side effects of shift work in future for prevention of them. At present, it is premature to extend this speculation into clinical decision making other than to consider a modification of work place. Because of limitations in financial sources and workers cooperation, it was not possible to measure the inflammatory markers in every night and day work, and so the trend of changes could not be detected. This trial is registered with Iranian Registry of Clinical Trials. (registration ID: IRCT138811133265n1). We thank Dr. Roohi Qureshi, MD, MEng, FRCPC, for correction in English and edition, and Chodan sazan factory (Isfahan, Iran); Hoseyn Ansari (manager of the factory), Maryam Farhang (health, safety and environment unit) for cooperation. 1. Caruso C, Rosa RR. Shift work and long work hours. In: Rom WN, editor. Environmental and Occupational Medicine. 4 th ed. Philadelphia: Lippincott Willams and Wilkins; 2007. p. 1359-64. 2. Seward JP, Larsen RC. Occupational stress. In: Ladou J, editor. Current Occupational and Environmental Medicine. 4 th ed. New York: The McGraw-Hill Companies; 2007. p. 608-11. 3. Barton J, Spelten E, Totterdell P. The standard shift work index-a battery of questionnaires for assessing shift work-related problems. Work Stress 1995;9:4-30. 4. Monk TH. Shift work. In: Kupfer DJ, Roth T, Dent WC, editors. Principles and Practice of Sleep Medicine. Philadelphia: Saunders; 2000. p. 600-5. 5. Akerstedt T. Adjustment of physiological and circadian rhythms and the sleep-wake cycle to shift work. In: Folkard S, Monk TH, editors. Hours of Work: Temporal Factors in Work Scheduling. Chichester, United Kingdom: John Wiley; 1985. p. 185-98. 6. Sparks K, Cooper CL, Fried Y. The effects of hours of work on health: A meta-analytic review. J Occup Organ Psychol 1997;70:391-408. 7. Spurgeon A, Harrington JM, Cooper CL. Health and safety problems associated with long working hours: A review of the current position. Occup Environ Med 1997;54:367-75. 8. Van der Hulst M. Long workhours and health. Scand J Work Environ Health 2003;29:171-88. 9. Volpato S, Guralnik JM, Ferrucci L, Balfour J, Chaves P, Fried LP, et al. Cardiovascular disease, interleukin-6, and risk of mortality in older women, the Women's Health and Aging Study. Circulation 2001;103:947-53. 10. Ferrucci L, Harris TB, Guralnik JM. Serum IL-6 level and the development of disability in older persons. J Am Geriatr Soc 1999;47:639-46. 11. Lange T, Dimitrov S, Born J. Effects of sleep and circadian rhythm on human circulating immune cells. J Immunol 1997;158:4454-64. 12. Irwin MR, Wang M, Campomayor CO, Collado-Hidalgo A, Cole S. Sleep deprivation and activation of morning levels of cellular and genomic markers of inflammation. Arch Intern Med 2006;166:1756-62. 13. Hohjoh H, Nakayama T, Ohashi J, Miyagawa T, Tanaka H, Akaza T, et al. Significant association of a single nucleotide polymorphism in the tumor necrosis factor-alpha (TNF - a) gene promoter with human narcolepsy. Tissue Antigens 1999;54:138-45. 14. Alberti A, Sarchielli P, Gallinella E, Floridi A, Floridi A, Mazzotta G, et al. Plasma cytokine levels in patients with obstructive sleep apnea syndrome: A preliminary study. J Sleep Res 2003;12:305-11. 15. Irwin M, McClintick J, Costlow C, Fortner M, White J, Gillin JC. Partial night sleep deprivation reduces natural killer and cellular immune responses in humans. FASEB J 1996;10:643-53. 16. Nishitani N, Sakakibara H. Subjective poor sleep and WBC in male Japanese workers. Ind Health 2007;45:296-300. 17. Hohjoh H, Terada N, Kawashima M, Honda Y, Tokunaga K. Significant association of the tumor necrosis factor receptor 2 (TNFR2) gene with human narcolepsy. Tissue Antigens 2000;56:446-8. 18. Wieczorek S, Dahmen N, Jagiello P, Epplen JT, Gencik M. Polymorphisms of the tumor necrosis factor receptors: No association with narcolepsy in German patients. J Mol Med 2003;81:87-90. 19. Vgontzas AN, Zoumakis M, Bixler EO, Lin HM, Prolo P, Vela-Bueno A, et al. Impaired nighttime sleep in healthy old versus young adults is associated with elevated plasma interleukin-6 and cortisol levels: Physiologic and therapeutic implications. J Clin Endocrinol Metab 2003;88:2087-95. 20. Bredow S, Guha-Thakurta N, Taishi P, Obál F Jr, Krueger JM. Diurnal variations of tumor necrosis factor alpha mRNA and alpha-tubulin mRNA in rat brain. Neuroimmunomodulation 1997;4:84-90. 21. Haack M, Pollmächer T, Mullington JM. Diurnal and sleep-wake dependent variations of soluble TNF- and IL-2 receptors in healthy volunteers. Brain Behav Immun 2004;18:361-7. Everson, C.A. and Folley, A.E. and Toth, J.M.